The mission of the North Shore Forest Collaborative is to revitalize and maintain a healthy and functioning ecosystem along the North Shore of Lake Superior with emphasis on restoring and maintaining native trees and associated forest communities. The Collaborative is a coordinated effort between local, state, and federal land management agencies as well as public and private organizations and individuals who want to work together to assure a healthy forest environment. 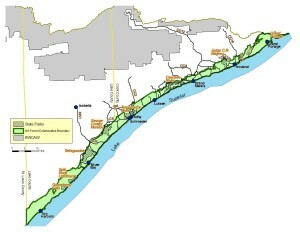 The project area for restoration treatment is defined as the coastal forest of Lake Superior along a narrow band of the Lake Superior shore to approximately 3.5 miles inland, generally following ecological boundaries. The area extends from the Lake County Line near Knife River, MN to the Canadian border, a distance of approximately 140 miles and encompasses approximately 270,000 acres or 422 square miles. Dying Birch, blow-downs, invasive species, deer browse, and ice storm damage are among those issues impacting our forest resources and presenting challenges to healthy ecosystems along the North Shore.